This past year was full of excitement at HEEFS! We welcomed new residents Tammy B., Heidi, Nancy, Cornelius, Hank, Clawdia, Elvis an our newest peacock and friend for Jerry, Jesus! 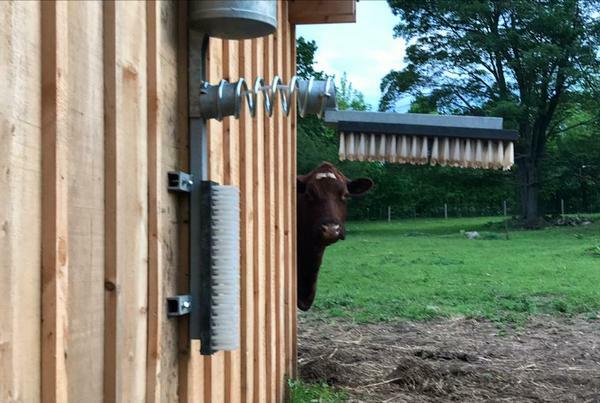 We made improvements to our shelters and pastures including electrical upgrades to the main barn, and we built a new shelter for our cows. With the help of our incredible volunteers, we planted a vegetable garden and added a dozen new trees to our orchard. 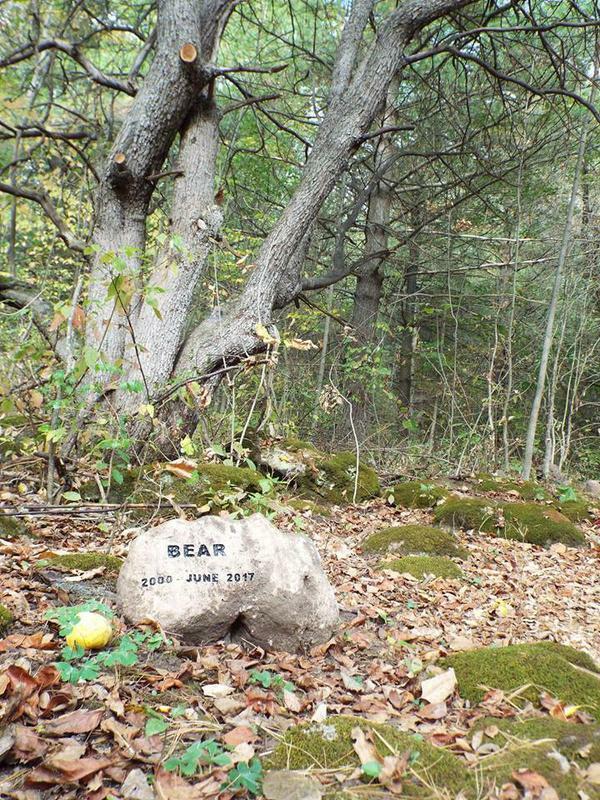 We established beautiful walking trails along the property and opened our Memorial Forest Trail to provide a quiet space where visitors can take a few minutes to remember those who have left us. Our quarantine space for new and ill residents was completed, and we lovingly launched Bear Care to provide the best possible palliative care for our aging residents. And that's only a partial list of all the work that was completed at HEEFS this year! We also welcomed almost 1,000 people from all over the world for Sanctuary tours and volunteer work days. And all of this was possible because of the generous donations from our incredible supporters. And we're even more excited about 2018! We've got some big plans for the coming year! We're going to finish our barn renovations and create four new comfy stalls for our residents. 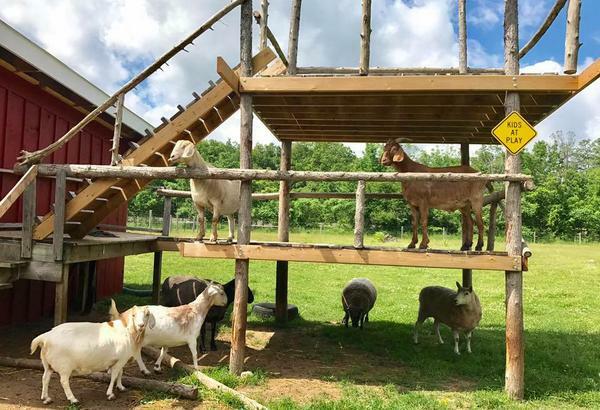 We're splitting our goat and sheep pasture into two parts - one for our more active residents and one for those who prefer a quieter lifestyle. And our feed room is getting a make-over too! It will include a larger food prep area and better storage facilities for our medical supplies. And when that's all done, we'll find more ways to help make the lives of our residents safer and more comfortable! Thank you again to all of our incredible supporters and volunteers. We couldn't do any of this without you! 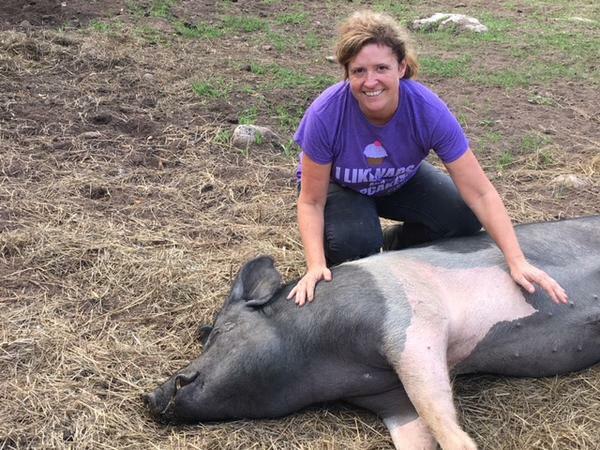 Like a lot of our volunteers, Kate was introduced to Happily Ever Esther Farm Sanctuary through Esther the Wonder Pig. Over the past year, Kate went through some difficult health issues and decided that she wanted to spend more time volunteering and doing things that truly make her happy. That's when she saw an online posting from HEEFS looking for help with tour days and she knew that HEEFS was where she wanted to be. Also like many of our volunteers, Kate started out slowly, volunteering on tour days, but it wasn't long before she got the "bug" and added feeding the residents to her list of activities at HEEFS. At first it was one feeding a week, then two...and now we are often lucky enough to have Kate help out with tours, feeding and general barn upkeep three days a week! During one of Kate's first volunteer visits to the barn, she saw Derek with Bear and went over to say hello. Derek told her to say hi to Bear and then come back later and do it again because Bear will recognize her voice and see her as a friend. Sceptical, Kate did just that and upon returning, and saying hello to Bear for a second time, he turned his head towards her and immediately started "talking". It was a magical moment and the start of a serious love affair with all things "pig" at HEEFS! 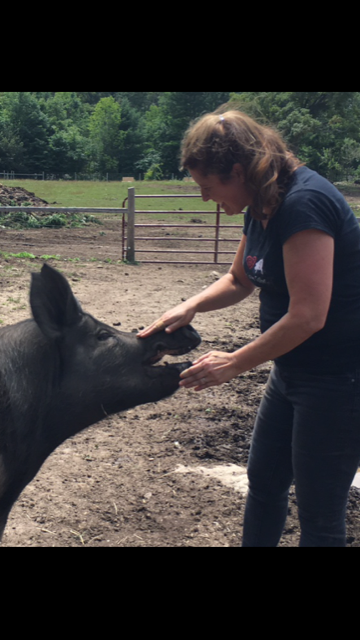 Kate enjoys spending time with all of HEEFS' residents but has a special place in her heart for our senior pig, Len, and his sidekick, piglet Hercules. "I love cleaning out Len’s stall and making him comfortable, giving him treats, and singing and talking to him," says Kate. "He is such a gentle soul. And Hercules is such a sweet boy. He loves belly rubs and he, too, gets lots of extra treats from me. He can be nervous around the other pigs sometimes so I like him knowing he is very special…especially to me." And you're very special to us, Kate!!! Get to know Pouty Face! He may look like he's always pouting, but this sweet boy is the most inquisitive and active of our three cows. Pouty, along with Jasmine and Sir Denver, were surrendered by a failing sanctuary near Quebec and came to live at Happily Ever Esther Farm Sanctuary in January of 2015. While his date of birth, and therefore his age, is unknown, what we do know is that he's nowhere near slowing down - especially if you show up in his pasture carrying a red bucket! Super smart, Pouty knows that a red bucket usually carries treats and, because he's an incredibly fast runner, he's always going to be first in line for that! And if there's kale in that bucket, he may not leave any for anyone else! Meet all of our residents! Keep our residents warm and comfy! When the weather is super cold, like it's been up here at Happily Ever Esther Farm Sanctuary, we go through a lot of extra straw to make sure all of our residents have soft, warm beds to sleep on. Please help make sure we always have a good supply of straw on hand to get through the winter months. Coconut milk is used in this sauce because it holds up well with lemon juice and won't curdle. If you need to use another plant milk, add the lemon juice at the end of the simmer time to prevent curdling. 1. Sauté the dairy-free butter and garlic over medium heat for 1 minute. 2. Stir in the vegetable broth, coconut milk, nutritional yeast, sea salt and lemon juice. Increase the heat to medium-high and bring the sauce to a simmer. Simmer for 3 minutes. As the sauce cools down, it will thicken slightly.